Hotel room rates in the top-25 most popular U.S. destinations are nowcastÂ¹ to average $203.69 this July, down from $221.3 in June, according to hotel online room rates derived from trivago's unique real time global multi-provider platform. Hotel room rates in the top-25 most popular U.S. destinations are nowcast¹ to average $203.69 this July, down from $221.3 in June, according to hotel online room rates derived from trivago's unique real time global multi-provider platform. The U.S. online average room rate (oARR), the world's best predictive analytic and hoteliers' only tool for "predictive benchmarking ®", ranges among the top-25 destinations from a high of $359 to a low of $98 this July. Based on industry surveys, e−forecasting.com estimates that in 2017 about 70% of all reservations are made online via brand websites and travel agent merchant websites, compared with only one-fourth eight years ago. On year-over-year basis, the U.S. average online room rate is now up (+0.1%), this July, from a year ago, which is lower than the previous month's year-over-year growth rate of (+2.8%). 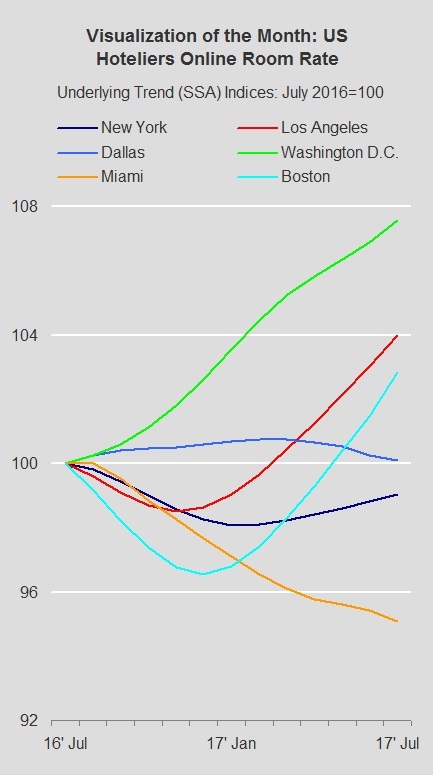 This July, the average online room rate in Boston, after rising (+3.5%) from last year, hit $359 a night, making the city the most expensive destination among the top-25 U.S. hotel markets. Seattle takes the second place now, in July, with an online room rate nowcast at $328, after an increase of (+4.1%) from a year ago. In New York, the online room rate in July is now shrinking (−2.4%) from last year to $280 a night, ranking the city in the third place of the most expensive destinations in the United States. 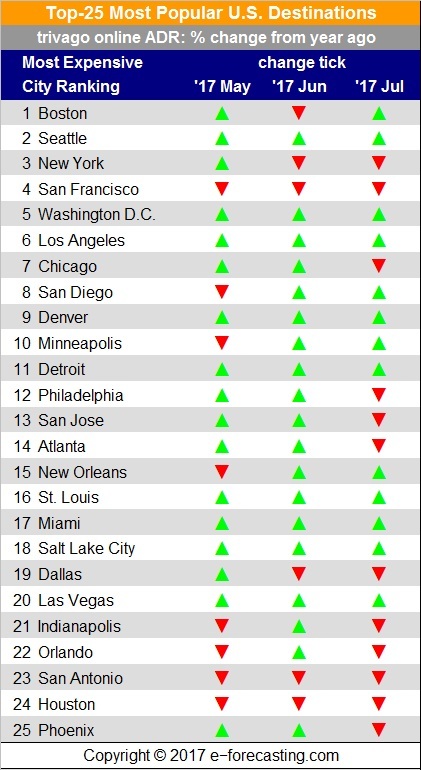 At the bottom of the list, the three least expensive, or most affordable, cities to visit this July are: San Antonio nowcasting an online room rate of $134 a night after a (−5.6%) change from a year ago; Houston posts now an online room rate of $112 following a (−9.7%) change from last year; and lastly, the most affordable popular destination in the country is now Phoenix with an online room rate of $98 after a nil change from a year ago. With a median online room rate of $185 amongst the top-25 most popular U.S. destinations, San Jose is nowcasted to be the country's average affordable city to visit this July. Moving from data to hotel-biz-analytics®, e−forecasting.com's Smoothed Seasonally Adjusted (SSA)² predictive analytic, which measures the so called (underlying) trend in online room rates, nowcasts $202.81 for July. On a month-over-month basis - the hoteliers' predictive analytic for tracking what's now and not what's the past - "nowcasts the national trend in online room rate this July to have increased (+0.4%) from the previous month, which is the same percent change as in June", said Evangelos Simos, editor of predictive analytics databases and professor of economics at the University of New Hampshire. 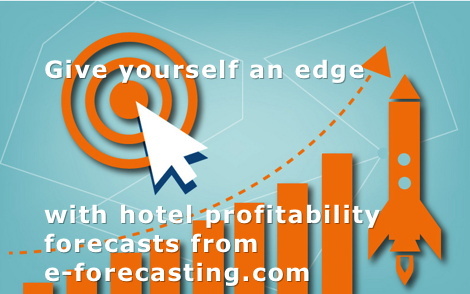 Combining the demand-driven trend effect with the market-specific periodic effect, e-forecasting.com offers hoteliers unparalleled predictive intelligence to optimize both what's now and what's next "predictive benchmarking ®". "Looking at the top-25 hotel destinations, the month-to-month percent change in the trend of online room rates in July ranges from a high of (+2.0%) in Seattle to a low of (−0.4%) in Salt Lake City. Amongst the top-25 destinations, the trend (SSM) in online monthly room rates is growing in 14 cities; and is falling or staying flat in 11 cities," Simos added. "Looking at profitability, hoteliers' ultimate gauge for decision-making, profits per room based on online room rates are down (−2.6%) on a year-over-year basis in July", said Maria Sogard, CEO at e-forecasting.com. It is the result of changes in two predictive analytics: the average online room rate is flat of its value, while e−forecasting.com national unit (per room) cost index is up (+2.8%). In our last month's report - June 2017 - year-over-year profit margins posted a reading of (+0.3%). A year ago - July 2016 - profit margins based on online room rates had posted a reading of (−3.2%). Using nowcast trivago's online hotel room rates for the top-25 U.S. destinations and nowcast e−forecasting.com's city-centric hotel unit (room) cost indices, year-over-year percent change in profits per room currently range from a high of (+19.0%) in Detroit to a low of (−18.6%) in Philadelphia in July. Amongst the top-25 destinations, nowcast predictive analytics on profits per room, based on online rates, are up in 9 cities; they are down or are flat in 16 cities. On tracking monthly the risk for business losses in providing services per room from online reservations, e−forecasting.com nowcasts the probability for hoteliers being in a losses (negative profits) phase of the hotel industry's business cycle for each individual hotel market and the national economy. For U.S. hoteliers, the probability of losses is nowcast to have hit 18% this month - July, which is lower than June's reading of 33%. In the top-25 hotel destinations, the risk for hoteliers being in a period of business losses per room - from online reservations - this July, ranges from a high of 94% in Philadelphia to a low of 1% in Seattle. "The predictive analytic for business losses per room is above 50% in 10 cities out of 25 cities; it is 50% or below in 15 cities," Maria added. Founded in Durham, NH in 1994, e-forecasting.com is a predictive intelligence consulting firm offering to clients customized solutions for what’s next. For over 15 years, its hotel insights division has focused on hotel predictive analytics and forecasting products for the top destinations around the world to enhance its clients’ competitive advantage and improve their bottom line. Founded in Düsseldorf in 2005 with operations in 39 countries, trivago is the world’s largest online hotel search site, comparing room rates from over 700,000 hotels on over 200 booking sites worldwide. Each month, more than 45 million visitors use trivago’s unique online technology, which compares 5 billion hotel deals a day - more than a trillion a year - and saves them an average of 35% per booking. Visit online http://www.trivago.com.